I wanted to include a brief “primer” of the ancient Germans. Most of us are not too familiar of our very distant forefathers. In the early history of the Germanic lands many different tribes migrated to settle the area. As descendants of the Germans who in turn migrated to America we may wonder about our ancient ancestors and their various tribes. During the last three years I have been gathering information if the ancient Germans tribes. In t he not too distant future my plans include a more details probe into the specific tribes, their history and the lands that they occupied. The Celts are the first recorded peoples of the territory now known as Germany. Scandinavian tribes gradually migrated from the north and conquered them. These northern people then settled the territory between the Elbe and Oder rivers and turned to agrarian pursuits. Although the earliest mention of the Germans is by a Greek navigator who saw them in Norway and Jutland in the 4th century BC, their real appearance in history began with their contact with the Romans. The chief historical sources for the culture and distribution of the Germans are Tacitus’ Germania and Agricola and the remnants in later ages of early Germanic institutions. 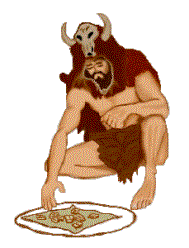 In the 1st century BC the area comprised an estimated 4 million people and land had become a scarce commodity. Because of this overpopulation, several tribes in the region began to emigrate including the Visigoths to Spain, the Vandals to North Africa, and the Angles and Saxons to England. Other tribes such as the Teutons and Cimbri were defeated and destroyed. Between 12 BC and 16 AD, the Romans tried to conquer the Germanic tribes but only a small portion of southwestern Germany came under their control. In AD 9 Arminius (Hermann), who had been trained in the Roman service, headed an anti-Roman group of Cherusci and this led to the disastrous defeat and annihilation of three Roman legions under the command of Varus in the famous Battle of the Teutoburg Forest. Alans, Alemanni, Ampsivari, Angivarii, Angles, Ansivarii, Artrivari, Atuatici, Bajuwaren, Batavians, Belgii, Bructeri, Burgundians, Buri, Caeracates, Cannenfates, Casuarii, Cenni, Chamavi, Chatti, Chasuari, Cherusci, Cimbri, Coldui, Condrusi, Canunefates, Coeresii, Dulgibines, Eburones, Fali, Franks, Frisians, Gepidai, Getae, Goths, Gugerni, Heruli, Hermionies, Hermunduri, Herules, Huns, Ingavones, Istavones, Juthons, Kugern, Latobrigi, Longobards, Lygii, marcomanni, Marini, Marsi, Mattiaci, Menapi, Narisci, Nemetes, Nervii, Northvolkers, Ostrogoths, Peucini, Poemones, Quadi, Rauraci, Rugii, Salains, Saxons, Scardosi, Schryi, Scorolisi, Seducii, Semnones, Sigambri, Suevi, Tenchteri, Teuteri, Teutons, Thuringians, Treveri, Triboci, Tubanti, Tulingern, Tungri, Twihaten, Ubii, Ulmerugi, Usippi, Vandals, Vangiones, Varini, Visigoths and don’t forget our beloved Vikings and their later Scandinavian conquests. My recent research of the old German tribes (Germanen) has led me to meet some very gifted and educated people. I have received valued opinions from such learned professors as Dr. J. Haberstroh, Prof. Dr. Peter Herz and Dr. Christof Flugel. All are archaeologists and experts in their field. The more common spellings of our name such as Küspert, Kispert, Kisseberth, Kissenberth, Kisaberth and Kisabeth have all evolved from the medieval surname of Küschwert in the Fichtelgebirge area of NE Bavaria. The approximate written date is around 1400. In genealogical respect the 15th century is an excellent beginning in personal surname history but in an actual timeline this era is relatively recent. Who were the ancient ancestors of our Küschwerts and where did they come from? We can only speculate but offer some valued opinions and theories based on facts that may shed some light to the tribes associated with our specific family history. On most maps of ancient Germany the tribe living in close proximity of the Fichtelgebirge was the Narisci, a subgroup of the larger Marcomanni tribe. I have received conflicting reports on the ancient inhabitants of the area. Most experts agree that the Fichtelgebirge was not populated or at best, sparsely populated, until much later when migrating tribes settled the area. The first mention of our Küschwert name is in the unseeded area. This is located in the Oberfranken area of Bavaria but also touches the Oberpfalz region. To this day some people of this area consider themselves more as ethnic Franconians while others are committed to the Bavarian ethnicity. Each village seems to have its own dialect. Inhabitants (Celtic Boii, Romaniced Celts, Romans in the south, Thuringians & Narisci in the north) who lived in the area during the centuries from the birth of Christ up to the 4th century. Germanic soldiers from various tribes as part of the Roman army mainly in the 4th & 5th century, settling there after retiring and becoming Roman citizens. The key contributors, providing the name Baju-vari (men from Bohemia) migrated from Bohemia about 100 miles west to settle first at the river Danube around the old Roman capital Ratispona (today’s Regensburg). From there the Bajuwaren moved upstream the rivers Regen (Nordgau), Inn-Salzach downstream along the Danube (Austria). It is now generally believed that the Bavarians are the descendants of the “lost” Germanic tribe known to the Romans as the Marcomanni. Considered the most important of the southern Suevic tribes, they were led by a brave noble, Marbod, who took his people to the east settling into the region of present-day Prague, Czechoslovakia. It is believed that the Macromanni stayed in Bohemia for about 500 years emerging as the Bajuwaren tribe. In the beginning of the first millennium (1000 AD) settlers came to the Fichtelgebirge from two directions: There were true Bavarians from the south and Franconians from the west. Regensburg and Bamberg were the seats of the bishops. Die markgrafen auf dem Nordgau, die Diepoldinger, leiteten aus dem bayerischen Raum von Süden her mit ihren Ministerialen im 11. und 12. Jahrhundred die kolonisatorischen Arbeiten. You can still distinguish the two parts of the region by the local dialects. The following Franconian places on the language border to the Bavarian places southeast of them; Ortschften, Heinersberg, Pilgramsreuth, Niederlamitz, Hohenbuch, Raumetengrün, Reicholdsgrün, Weißenstadt Franken, Meierhof, Bischofsgrün, Warmensteinach, Weidenberg. In the medieval history of the Fichtelgebirge the Sechsämterland (six communities) consisted of the towns of Selb, Wunsiedel, Hohenberg and Thierstein and the Franconian towns of Weißenstadt and Kirchlenlamitz. The Sechsämterland Dialect, which belongs to the North Bavarian Dialect, is still spoken in most parts of the Landkreis of Wunsiedel today. 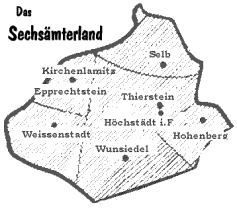 The Sechsämterland belonged to the Egerland (first mentioned as ‘Regio Egere in 1135 AD). The Egerlanders were North Bavarian settlers. Later the counts (Burggrafen) of Nuremberg bought more and more parts of the west of the Egerland. Until 1415 the western part, the Sechsämterland (including Wunsiedel from 1285 on) belonged to the Nurembergers. Wunsiedel and the Sechsämterland became a part of Franconia politically but there was no change in the population, and the people kept their Bavarian dialect. It is kind of strange that Wunsiedel and the Sechsämterland only “returned” to Bavaria when Franconia became a part of Bavaria in 1806, after the Napoleon wars, by force. Confusingly, ethnic Sechsämter-Bavarians who had lived in Franconia again became Bavarians. Politically Wunsiedel is still a part of Oberfranken but the people are Oberpfaelzer. Nowadays, strange as it is, some Sechsämterlanders believe that they are – or have become- Franconians. Very simply; we have Küschwert ancestors that considered themselves as true Bavarians and Küschwert ancestors that were Franconians (considered settlements of various tribes including Alemanni, Franks, Thuringians, Bajuwaren, Slavs and Saxons. When our ancestor Georg Kuschwert migrated west to Wertheim am Main in the mid 1550s his marriage or his son’s marriage introduced other possible Germanic tribes who had settled in what now is the Baden-Württemberg area. The smaller tribe called the Scardosi appeared to occupy this area about the time of Christ. Later, the larger Alemanni tribe occupied the Odenwald (SE of Frankfurt am Main). The Odenwald was the area between Wertheim and the southern portion of Hessen-Darmstadt where our Kisseberth ancestors lived. During the last years of the 6th century Alemanni troops were defeated by invading Franks. In the Hessen area the Chatti tribe were the early occupants perhaps even reaching to the northern Odenwald area. possibly the Chatti tribe in the Odenwald associated with the Kisse(n)berth name.